Ted Wong is no longer in physical form. There will be an even for the celebration of his life on January 16th. I like to see it that way: “celebrate his life”, knowing that he will always be here in some way. I had the pleasure to meet him and have a memorable conversation with him and would have like to have more opportunities for that. Best Wishes to Ted Wong and his loved ones. Bruce Lee is most well known for his captivating on-screen performances complete with chilling animal sounds, flying kicks, and, of course, the famed nunchaku. Although today’s generations are getting exposure to the Bruce Lee legacy through new TV documentary’s, video games, and MMA, there is a side of the legendary Martial Artist that deserves attention — Jeet Kune Do. Jeet Kune Do, in many ways embodies the exact opposite of what we see in Lee’s movie action sequences. Its simple, direct, and no-nonsense approach to combat don’t lend themselves to the flashy movements that moviegoers expect. 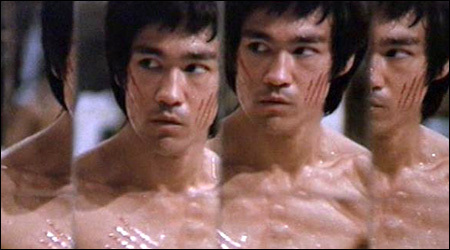 Yet, when examined closely one can see that Bruce Lee does, in fact take care to showcase much of his Jeet Kune Do methodology. Perhaps the movies containing the most representative Jeet Kune Do sequences are Return of the Dragon and his Hollywood hit, Enter the Dragon. 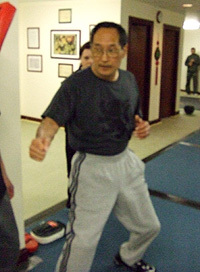 Some of the techniques we see include his modified trapping, stop hits and stop kicks, elusive footwork, deceptive entries, broken rhythm, half beat timing, and tons more. It’s important to know how to separate the entertainment based theatrics from the real deal but it’s good to know that much of his JKD is carefully embedded within his movie combat sequences. The enthusiast looking to start martial arts training and use some of that signature Bruce Lee inspiration, would benefit greatly by searching out a qualified Jeet Kune Do Instructor or a reputable school. 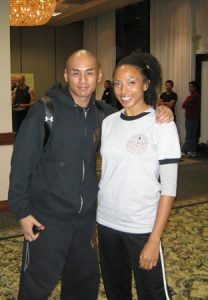 Photos taken today Nov 14th 2009 at the Bruce Lee Foundation JKD Summit. The event took place at the Sheraton Universal Hotel in Universal City, CA. Bruce Lee followers and Jeet Kune Do practitioners came from all around the World, including places such as Italy, Germany, and Netherlands. 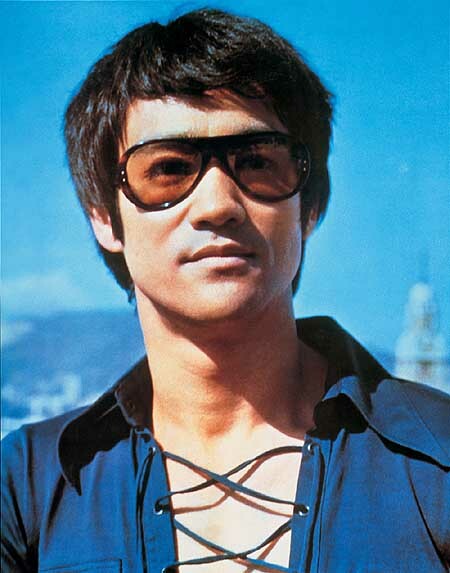 The BLF (Bruce Lee Foundation) presented the first of a series of books containing Bruce Lee’s original manuscripts. With the process of de-acidification the papper is now assured to last intact for hundreds of years! Comparing with last year’s Summit at Seattle, this time it was a much more intimate experience. Closer to a Jeet Kune Do family. 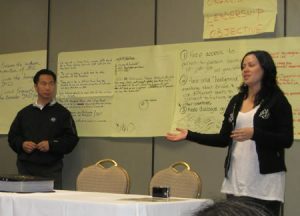 Shannon Lee and the BLF invited the attendants to get into smaller groups with people we didn’t know, and this way interact and debate the different ideas regarding the future of Jeet Kune Do and the Bruce Lee Foundation. Each group wrote its ideas in big paper sheets and then speak them out for all the attendants to hear. After that Shannon posted the sheets in the wall as you can see in the picture above. 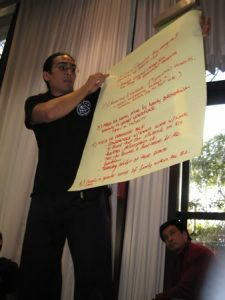 Most of the groups agreed about the need to educate the newer generations and continue promotion of the Bruce Lee Legacy on a global scale. As always a main theme was to define and preserve the original Bruce Lee teachings and at the same time respect the evolution of this living Martial Art. As Shannon mentioned, Bruce Lee would express that once you put it in a box and say “This is Jeet Kune Do” it won’t be a living art anymore. Above: Michelangelo stunt double from the original Teenage Mutant Ninja Turtles movie. 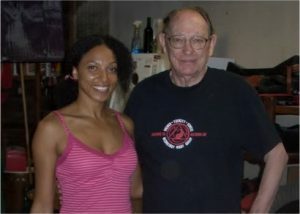 We met at several Martial Arts related events. Tonight was a very special night! I had the great experience of attending the Jeet Kune Do Wednesday Night Group, and directly learning from first generation students of Bruce Lee. It was an honor to train under Tim Tackett and Dennis Blue direction. I also enjoyed a great time after, conversing with Tim Tackett, Bob Bremer, and Jim Sewell in a cordial gathering. I felt like I was inside of a legendary movie!!!! I love how they are open to exploring other systems in order to continue enriching their understanding of the martial way. Here is a video featuring Ted Wong speaking at Bruce Lee’s 35th Anniversary. Right before, he and I were sharing memories from Spain, my home country, were he was telling me he had been and had a great experience! Video contributed by Cliff Lenderman, host of MAIA maTALK audio CD, where I appear in my trip to Seattle for the 35 Bruce Lee Anniversary. Linda’s positive energy when she speaks of Bruce Lee, makes me feel as if she would have been spending every single day with him. She is a very inspiring and radiant woman. Phoebe came to me before knowing me and told me “You are very strong” , with a kind and familiar attitude, as if we were long time friends. She normally brings her sword with her, but didn’t have it at that moment. Shannon is lovingly dedicated to the Bruce Lee Foundation. Today, July 20th, was the Bruce Lee 35th Anniversary Celebration. 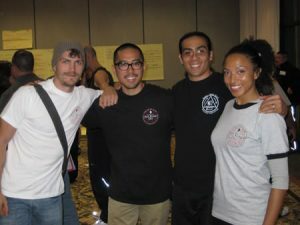 I traveled to Seattle to enjoy the Interviews and Q&A sessions offered by the BLF (Bruce Lee Foundation) with Bruce’s 1st Generation students. It was refreshing to listen to stories directly from this charismatic Martial Artist’s friends and family rather than from books or articles. 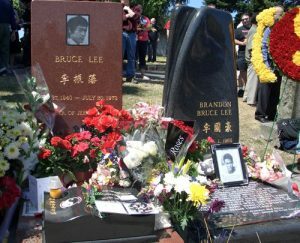 I also enjoyed watching “Enter the Dragon”, and attending the Graveside Memorial Ceremony with Bruce family and friends. It was extremely inspiring to meet Linda Lee Cadwell, Bruce Lee’s Widow. I would better address her as Bruce Lee’s Wife, due to her way of talking about Bruce Lee. It felt as if she was still with him and have been with him every single day. She was radiant, elegant and full of contagious positive energy throughout the weekend. 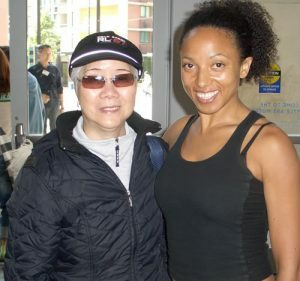 Linda, as well as Shannon Lee and Phoebe Lee (Bruce Lee’s Daughter and Sister), were extremely kind. I felt the warmth of being in family! Definitely an experience worth remembering. There were also Bruce Lee’s 1st Generation Students including Ted Wong, Jesse Glover and others, as well as the excellent Martial Artist Thomas Carruthers, who offered an impressive demonstration of his skills. The UFC sponsored this weekend’s convention. It was a beautiful experience! So many different cultures were represented this weekend. I am sure Bruce Lee would be pleased with the outcome of this celebration.